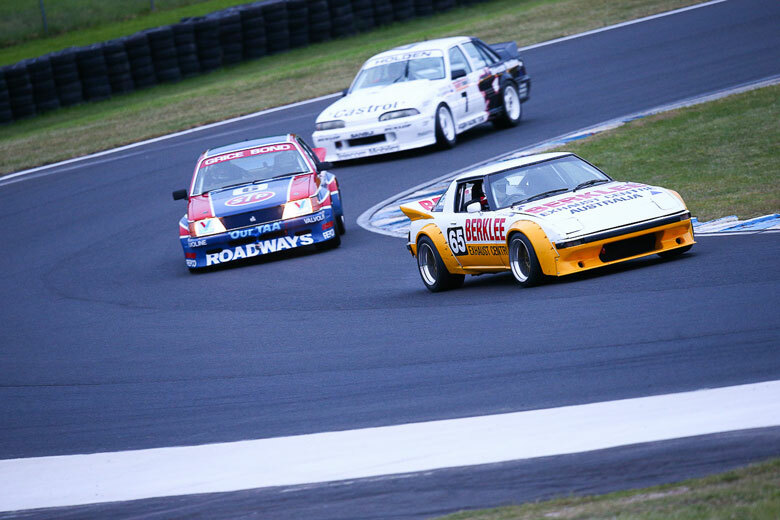 2014’s Heritage Touring Car Championship was full of exciting racing, unforgettable duels and good people bringing the history of Group C and Group A Australian touring car racing to life. 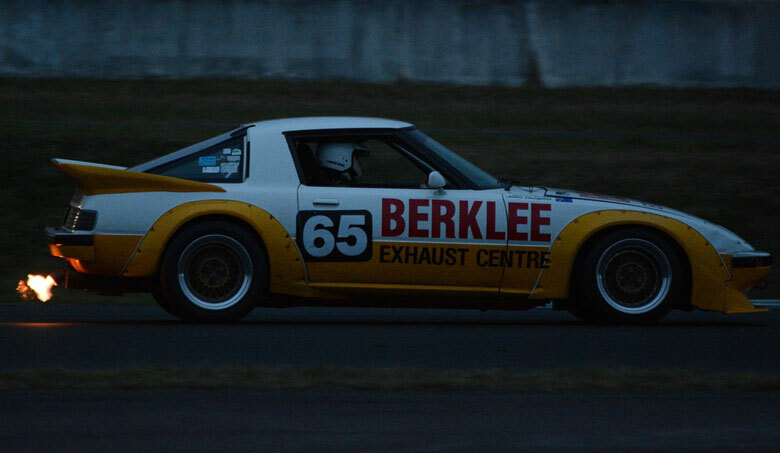 The Championship wrapped up at Sandown in November, with John Douglas and Terry Lawlor winning the Peter Brock Trophies for Group C and A respectively. As we prepare to farewell 2014 and look forward to a fresh and exciting season of competition in 2015, we thought we’d have a chat with John and Terry, to get their perspective on a season well raced. Let’s hear from our 2014 Group C Heritage Touring Car Champion – John Douglas! JD. I live in Tasmania and we did all of the restoration and all of the work on the car here. Going in to the season we weren’t sure how competitive we’d be. The Championship started at Phillip Island, so we decided to go there and see if we were competitive. If we were, we’d do the next round! We set the second fastest time, I think. So we were on to the next round! Next up was Sydney Retro Speedfest at Sydney Motorsport Park. We went there, and won the day. That gave us great impetus to do the next round at Morgan Park, where we won again, winning the John French trophy as well. We then headed back to New South Wales for Muscle Car Masters at Sydney Motorsport Park. I didn’t have any good wet weather tyres and it rained a lot over the weekend. The car wasn’t working well so I couldn’t get any really good times in. We then broke a diff, so I had my first DNF of the series. I think at the end of that weekend I came second in the over 3.0-litre class. I was leading the points going into that round, and that put me into second by two points. It would come down to the last round of 2014 at Sandown. Sandown’s not a circuit that suits the Mazda – the V8s run away from me down the two long straights. We also had an issue with one of the drive hubs on the diff, so we had to fight to get a good position in the last race of the day and secure enough points for the championship. I won the over 3.0-litre class, which gave me enough points to win series as well. HTC. It’s a competitive season, with a lot of fast cars and tidy steerers on the grid, and we enjoyed some truly brilliant racing in 2014. Does any moment in particular stand out to you as a highlight? JD. The best race of the series for me was at the Speedfest against Ed Singleton in the STP Commodore! It was a 12-lap race and we swapped the lead every lap. Just incredible. He’d pass me down the straights and I’d pick him up and pass him around the back of the circuit. Then we’d come up to the straight again and by the start/finish line he’d pull past me. It went on lap after lap! Coming up to the end of the race I knew that I needed another car length on him before the last corner before the straight. I put my head down and drove as hard as I could – I think I won by .02 of a second. It was the best race of the series for me, and a memory I’ll keep with me for a long time! I couldn’t believe the reaction when we got back to the pits either. People were so excited that a rotary had beaten one of the V8s! I had people taking photos with me, shaking hands and signing autographs. It was so exciting to be a part of and it’s such a fantastic memory for me. HTC. Where did your passion for racing and Group C come from? JD. I started racing when I was 17 in an FJ Holden. Group C has always been the category of racing which I most fondly remember, so Ideally I was looking for a V8-type car to run in the series. My Mazda was built by the late Ken Hastings in Melbourne, and was one of four Mazda race shells that came to Australia in 1981. Two of those shells went to Allan Moffat Racing, one I think went to Barry Jones in Sydney, and then one became my car. Ken only ran it for about two years before selling it to David and Ron Grose in Queensland. They took it to Bathurst in 1983, and I think it blew an engine on the very first lap. Then a gentleman by the name of David Cox ran the car for the rest of ’83 and ’84. After that it lay dormant for two years in Queensland, before it was brought to Tasmania and sold to Wayne Smith. Wayne raced it in Improved Production quite successfully. I originally approached Wayne when he was running it in Improved Production, but he wasn’t ready to sell. We kept in touch over a couple of years and one day he said ‘Yeah, I’m ready!’ I’ve had the car for seven or eight years now. When I picked it up I was unaware of the level of history that it had. It had only had two owners since the Group C days and they’d kept all of the parts from the era. I went with a trailer, and had to come back with a truck to pick up all of the parts! The restoration took three of four months and at the end of it I realised that I’d become the custodian of a piece of history that’s very special. You really come to appreciate the significance of it when you’re sitting on the grid surrounded by the cars you drooled over as a kid. It’s beautiful. It captures that moment in time and the culmination of all of that to winning the 2014 HTC Group C Championship is just a dream come true. I also race an XU1 Torana in my home state, and this year we won the Historic Touring Car Championship, and the Baskerville Sportsmans’ Award for the person who has achieved the most in the sport in 2014. It’s been a momentous year, and we’re very grateful! HTC. What was it that drew you to this particular car? JD. When spectators come up to me at the circuits they’re really enthusiastic that I’ve brought along a rotary-engined Mazda. They love it. Most people would assume that I love rotary engines, but that’s not necessarily the case. My love is with Group C cars and it just happens that this is the car which found me! Now that I’ve run it and gotten to know it, I’ve come to realise that it has some qualities which some of the other cars don’t have. It’s light, handles well, stops well and corners quickly. Even though we miss out a little down the straights we more than make up for it in the corners! When Allan Moffat won the championship with his car there was a fair amount of controversy around it, probably because it was so different. Now that I’ve had the opportunity to drive one in competition I can really see how he did it, because the things handle so well! I’ve watched as much of the footage as I can, and the Mazda’s cornering ability really made them stand out. I wanted to watch Allan’s car to see its attitude through the corners and get a feel for its ride height and steering angles for camber and caster. I’ll see differences in setup between tracks and question why that was and how he was so quick at certain meetings. Then I try to apply what I’ve seen to my own car. HTC. Each of our competitors plays an important role in preserving a living history of the sport. They keep these magic machines out on the track doing what they do best, and bring a lot of joy to those of us who are passionate about the sport, the cars and their combined history. Looking after your car yourself, and transporting it to and from Tasmania every round, you’re certainly one of the hardest working drivers in the field. Could you give us some insight looking after and competing with the car? JD. My wife and I travel to and from the meetings. We live in Tasmania, so it can take a week or ten days to travel across the Bass Strait to what ever track we’re competing at – all the way up to Queensland sometimes! I have a little purpose-built flat-tray Mercedes truck which enables me to get the car onto the boat. If the vehicle was too high we wouldn’t be able to get on! I’m also a mechanic with a service station and workshop in Hobart. I do most of the work at home, and do any preparation, setup and modification work myself. I don’t know a great deal about rotary engines, so if I need to do any work on the motor I pull it out and give it to Paul Morgan who has a great affinity with them and does a wonderful job looking after it. I love driving, but part of the appeal of motor racing for me has always been the ability to modify and make things work. At home in the workshop when I have to pull something apart and look for a problem, it’s a great challenge to repair the problem and make it better than it was before. This all makes competing itself, and especially the success we’ve found, extremely rewarding. HTC. What draws you to the Heritage Touring Cars Championship? JD. The guys are all there because they love the categories. The Group C guys all bought their car to keep the history of Group C, which up until the end of 1984 was the premiere category in Australia, alive. Each of the competitors through their own vehicle have found a particular joy, and as soon as you ask a question you’ll receive a wonderful dialogue and banter about the car and its history. Everyone is involved because they’re passionate, and that is evident at every meeting. I’ve been absolutely ecstatic with how the car went and the reaction of the other competitors and the spectators! The racing is respectful and fun. Your biggest competitor is really yourself and your own personal best lap time. At all costs you’re working to avoid any contact with someone else. We’re all aware of the history of our cars and look after each other while still being competitive. A huge ‘THANK YOU!’ to John for taking the time to chat with us and for sharing such terrific insight into his season. Congratulations to our Group C Heritage Touring Car Champion for 2014!